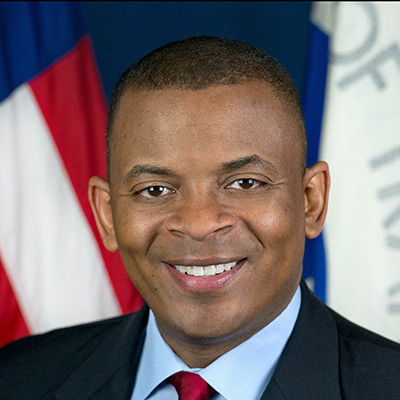 Anthony Foxx is the 17th United States Secretary of Transportation and the former mayor of Charlotte, North Carolina. As Secretary of Transportation, he led an agency with more than 55,000 employees and a budget of $70 billion. Sec. Foxx was responsible for overseeing American air, maritime, and surface transportation and ensuring that America maintained the safest, most efficient transportation system in the world. Confirmed by a rare 100-0 Senate vote, Sec. Foxx’s career success is indicative of his demonstrated ability to push forward in an era of deep partisan divide. Crafting an ambitious agenda to modernize America, he pressed Congress to pass the nation’s first long-term surface transportation bill in more than a decade. Sec. Foxx energized DOT’s embrace of innovation to help solve these problems by launching the Smart City Challenge, a national competition to implement bold, data-driven ideas that make transportation safer, easier, and more reliable in that city. He also worked to accelerate the Department’s efforts to incorporate vehicle-to-vehicle (V2V) communication technology into new vehicles. He is currently a Managing Partner with Related Infrastructure, the infrastructure-related investment arm of Related Companies. Called “the Great Connector” as a result of his efforts to update, streamline, optimize, and digitize the nation’s transportation system, Sec. Foxx is exclusively represented by Leading Authorities speakers bureau and discusses the American transportation system, innovation, and coalition building. In 2015, Sec. Foxx refocused the national dialogue on the future of transportation infrastructure by releasing Beyond Traffic, a report on the challenges facing American infrastructure over the next three decades. Beyond Traffic highlights the importance of giving local governments reliable, long-term funding to plan critical investments in transportation infrastructure and has already influenced decisions by elected officials, planners, and stakeholders nationwide. Sec. Foxx championed this goal during hundreds of Congressional meetings, two bus tours, and visits to 43 states before securing a 5-year, bipartisan surface reauthorization bill from Congress in December 2015. Sec. Foxx believes that transportation should not only bring people from one place to another but should also create opportunities for the places and people in between. He leveraged the resources of the Department to connect communities to economic opportunity while encouraging land use planners, engineers, and decision-makers to revitalize and reconnect underserved communities. As mayor of Charlotte, North Carolina, Sec. Foxx successfully pushed the two largest investment packages in the city’s history, including transportation, housing, and neighborhood improvements, making efficient and innovative transportation investments the centerpiece of Charlotte’s job creation and economic recovery efforts. This included extending the LYNX light rail system, the largest capital project ever undertaken by the city; expanding Charlotte-Douglas International Airport, the sixth busiest in the world; working with Governor Beverly Perdue to accelerate the I-485 outer belt loop using a creative design-build-finance approach; and starting the Charlotte Streetcar project. Sec. Foxx served two terms on the Charlotte City Council, where he chaired the Transportation Committee. He is a former law clerk for the U.S. Sixth Circuit Court of Appeals, trial attorney for the Civil Rights Division of the U.S. Department of Justice, and staff counsel to the U.S. House of Representatives Committee on the Judiciary.